Discussion in 'Site Support & News' started by SteveNeill, Oct 19, 2011. I'm now moving on to the next phase of this so far year long project. I am producing a short film high end HD with studio effects to close my 47 part series on the building a studio moel of the Enterprise. We are going to shoot the model against green screen and composite it against Lightwave CGI backgrounds and effects. 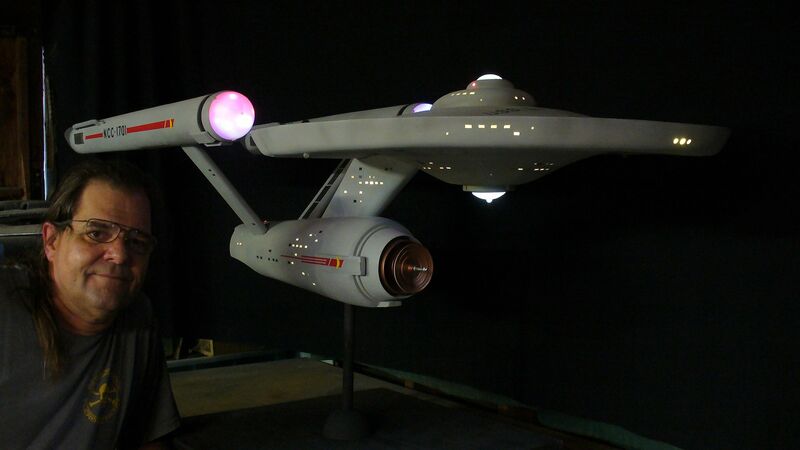 In addition I'm building CGI virtual set of the TOS bridge. And then there's the the Captain's chair for the bridge. Since a CGI chair won't work well for me to sit I am building a real chair to place on the green screen set so I can be placed in it and on the bridge. To spread a thread out over three different sections would be an inconvenience to be sure. There will be another series of videos for the making of the short covering all these subjects from CGI to the chair construction. What is the best thing to do then? Please no replies except from the RPF staff. Thank you. Anyone? I waiting to post and if I just go ahead and post anywhere the thread will be moved because it's not the right forum from subject to subject CGI-through props.